Above: Independent route traces of AC Transit buses from a recent Monday morning in the East Bay. I have found the AC Transit 18 bus to be an unreliable form of transit home, from Downtown Berkeley to MacArthur. I wanted to compare this bus line to the 6 line, which I “feel” performs better. The below logs how I went about gathering the data to perform a comparison. I have been logging all GTFS-RT vehicle location data for the active AC Transit fleet at 30-second intervals for a few weeks now. The set up is fairly simple and involves a micro virtual machine instance and plenty of cloud storage. 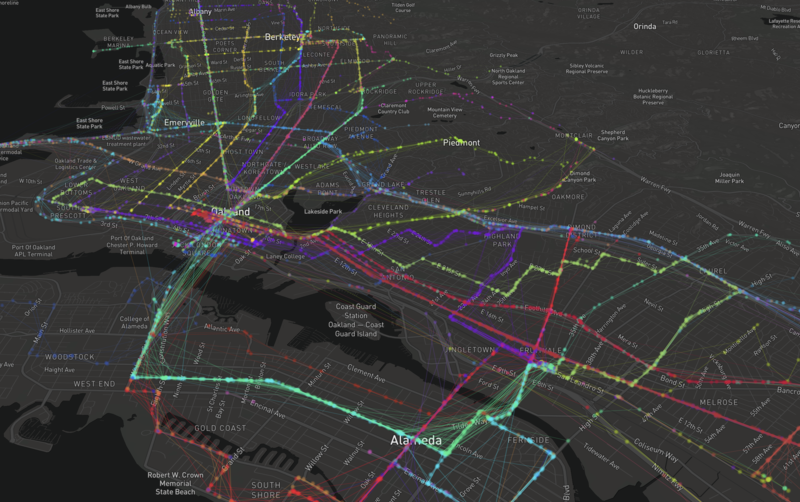 For the purposes of this post, I’ll simply state that I have a dataset of all vehicle locations in the AC Transit network that are active, at 30-second intervals, for a few weeks’ time. Each dataset is held as a JSON representation of the GTFS-RT (real time) protobuf. You can see what this looks like, visually, in the image at the top of this post. I want to geofence my analysis to the area that covers the route segment from downtown Berkeley to just south of 38th St. in Oakland, where both routes pass under the freeway. Now that I have my reference object, I can begin looking at my trace data. Again, these are held as JSONs on a Google Cloud bucket and I’ve pulled down values from the week of May 20th, locally, to play with. This prints “Evaluating 11437 files.” That corresponds to roughly 4 days of trace data (Monday through Thursday). This is the data we will be working with. Note that want_routes is just a list of the names we are interested in, which is [‘6’, ’18’]. This allows me to ensure I am always comparing the same line (“apples to apples”), which allows me to safely calculate the portion of the route that has been covered by that time stamp. Also note that I use just a giant box to delete/crop out the bottom of the route. It just so happens that the routes are laid out in a way that lets me hack this together. A better solution would be to slightly buffer the interpolated point, perform an intersection, and drop all but the first segment of the route. But, this is just a quick analysis so, whatever! Now I need to group the data by unique trip and vehicle. I need to do this so I can get the time difference since the route entered the top of the geofenced area and create a new “time since starting line” value (time delta). I want to do this because the routes start at different points so I could not reasonable compare them from their different time starts, otherwise. This allows me to see the spread of run times over the week, as well as the standard deviation. From these results, I can see that both the 18 and 6 bus perform roughly equivalent along their respective paths. This is in contrast to what I perceived as more poor performance along the 18 line. I chalk this up to the flaws of human perception and personal experience. In aggregate, the data shows that the 18 appears to be comparable along its path to MacArthur as the 6 bus is. First, we need to convert the line shape data for each route into a series of segmented lines. Doing so will allow us to attribute the portion of the trip that segment corresponds to with the number of buses out of all vehicles that have passed through that segment by a given time. Note that the second function trims out a small bit from each part of the route to break it into 20 discrete segments. Each segment is 1/20th of the total route. So, we will be thinking of the route in 5% chunks. I’ll just breeze over this segment, as it’s a fairly conventional implementation of MB GL JS. If you’ve got any other ideas for analysis of AC Transit bus performance data, feel free to hit me up and pass it along!